What's growing at Biosphere 2? 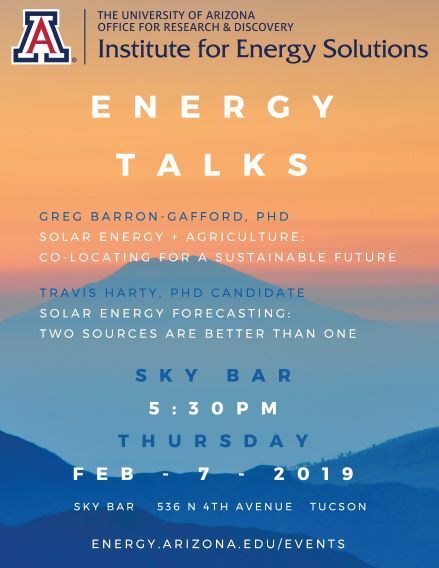 February's ENERGY TALKS promises to be sensational with UA Professor of Biogeography and Ecosystem Science, Greg Barron-Gafford, who will highlight the latest research in solar technology and agriculture. Travis Harty, PhD Candiate in UA's Applied Math Program will tell us about how solar forecasting is being improved by using satellite and weather models. The beer is cold and the discussion will be lively! Join us at Sky Bar on February 7th, 5:30pm.